Here we go again. 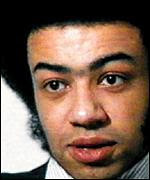 The former 80s radical and Brent South MP Paul Boateng, once the chair of the GLC's police committee and a critic of the Met, continues his journey from left to right in spectacular style. When Boateng was elected to Parliament in 1987, he famously declared in his election speech, "today Brent South, tomorrow Soweto!" Somehow, I doubt whether the young leftwinger imagined then that one day he would be making money from the kind of unaccountable business that has caused so much misery to Africa, by joining the board of a military company that supplies mercenaries for hire. The Sunday Times reports that Boateng, who was Britain's first black Cabinet Minister before Tony Blair gifted him the post of High Commissioner to South Africa, is now a member of the board of Aegis Defence Services, the company run by Colonel Tim Spicer. Spicer was at the centre of the arms-to-Sierra Leone scandal in 1998 and is a business associate of Simon Mann, the recently returned mercenary and coup plotter who was released from imprisonment in Equatorial Guinea. Whilst in office as High Commissioner, Boateng was involved in lobbying the ANC government against anti-mercenary legislation designed to prevent South African citizens fighting for foreign armies as 'dogs of war'. The Times report says that South Africans are believed to be the second largest nationality after Americans working for private military companies in Iraq, where Aegis has multi-million pound contracts. Mr Boateng, we salute your indefatigability in the pursuit of money at the expense of principle. The days of standing up to Met Commissioners Sir David McNee and Sir Kenneth Newman must seem like a long, long time ago. And so many former lefties, some members of trot groups in their hayday, have totally and utterly capitulated at the end of the day. There has to be something in the water at Westminster! Boateng should be ashamed of himself, being involved in something so vile. Mind you, I expect the money helps. "Mr Boateng, we salute your indefatigability in the pursuit of money at the expense of principle. " And welcome to New Labour. Following in the footsteps of Peter Hain.